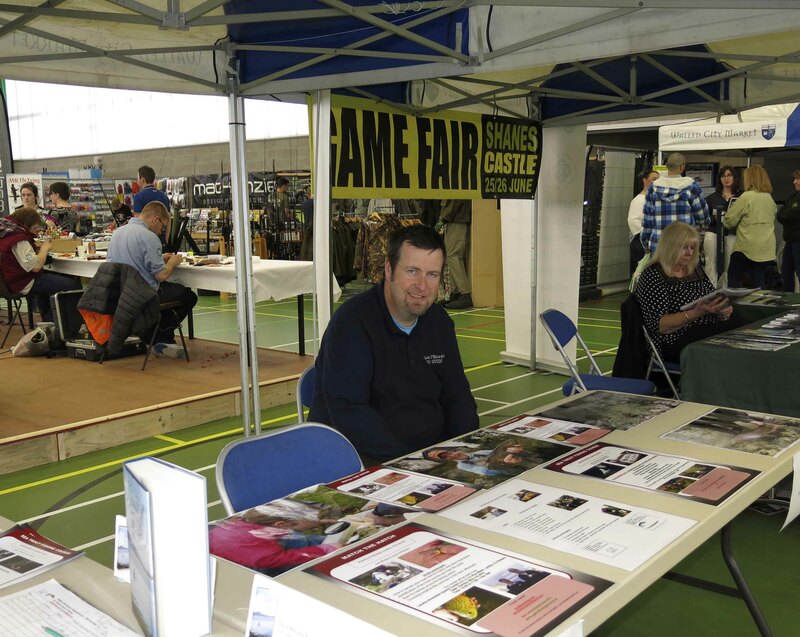 On Friday evening I made the long journey from Waterford up to Strabane, Co. Tyrone to the North West Angling Fair. 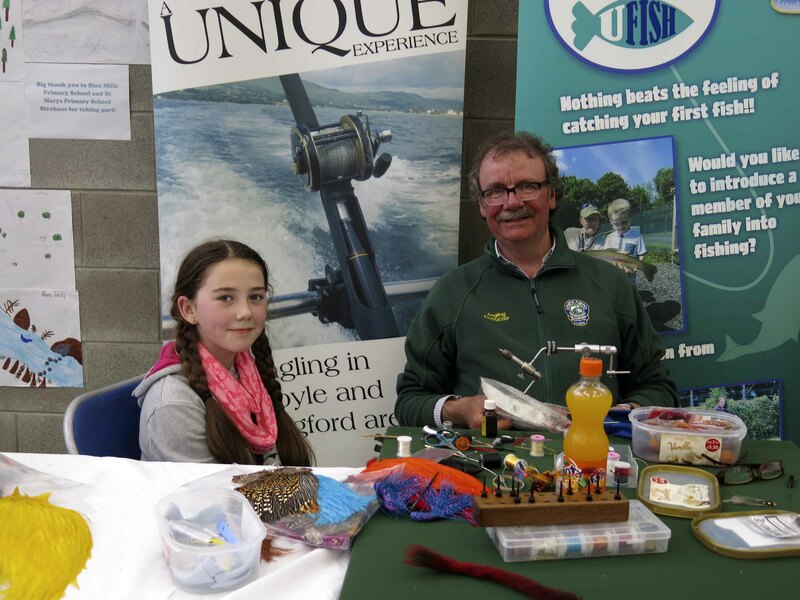 This was a new event on the Irish fishing fairs calendar so I wasn’t sure what to expect but I knew there were some really good people involved in the organising of it so I was quietly confident it would be a good one. It was late enough when I arrived and got checked in to the Fir Trees Hotel where I was joined by my good friend Dr. Ken Whelan who was going to be giving a series of talks with me at the fair. 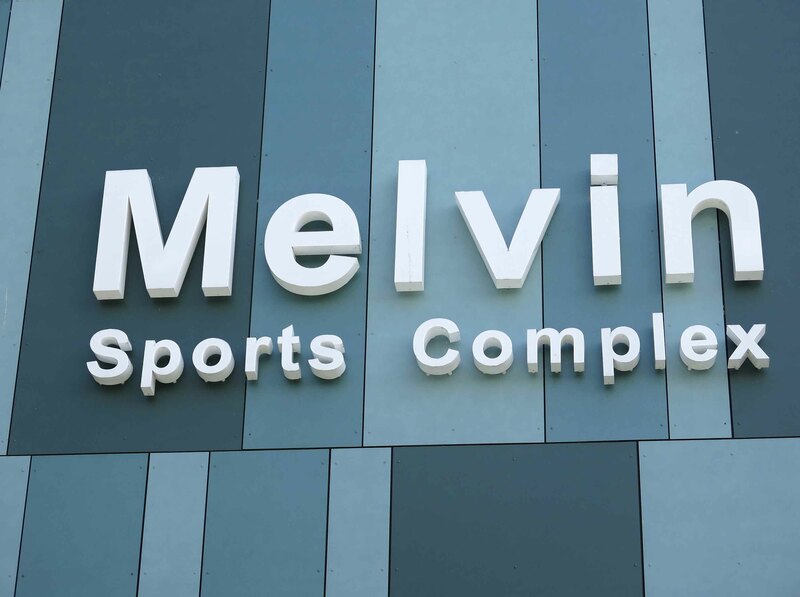 On Saturday morning Ken and I went down early to the Melvin Complex which was the venue for the show. 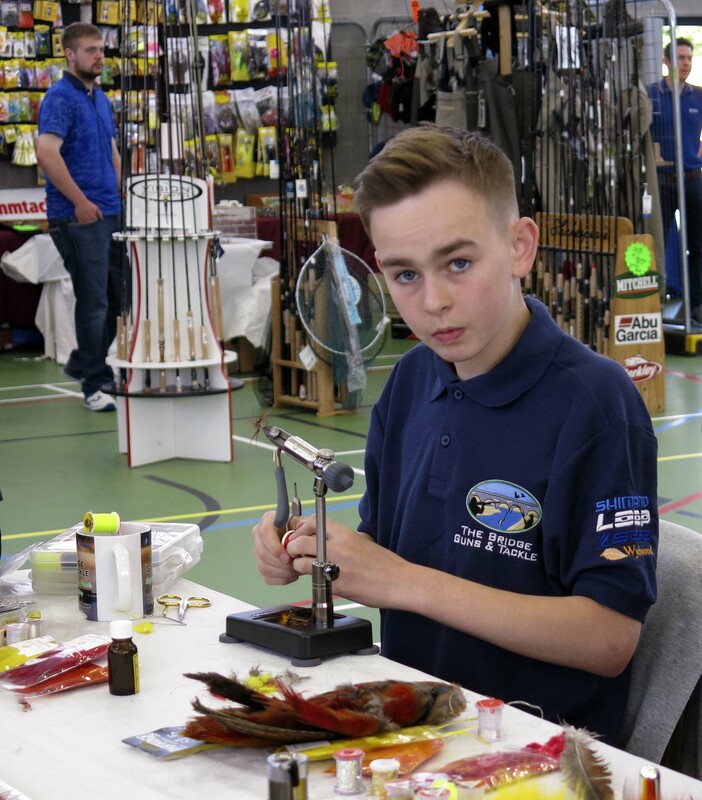 Everyone was busy setting up their stands and it was great to meet a few familiar faces on fly tyers row and the trade stands. 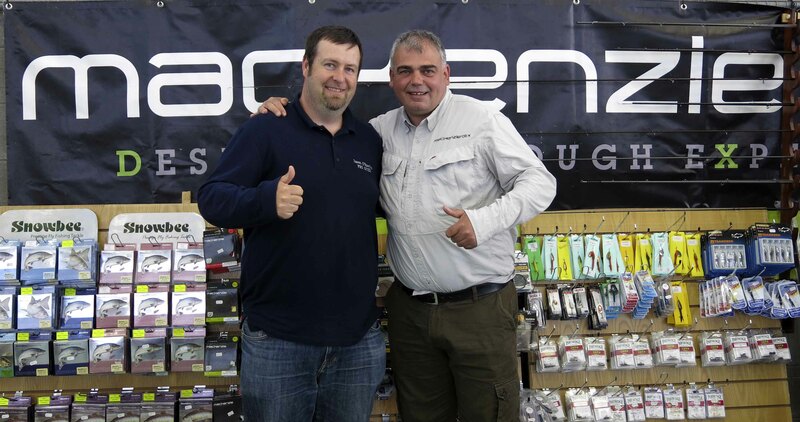 My good friend Shane Rodgers from Rodgers Tackle was there with his fly tying materials and Brendan Winters has a fantastic range of fishing tackle. Declan Tuffy, Stevie Moates, Roy Christie, Brian Finaly, Peter O’Reilly and many more were tying all sorts of wonderful flies. 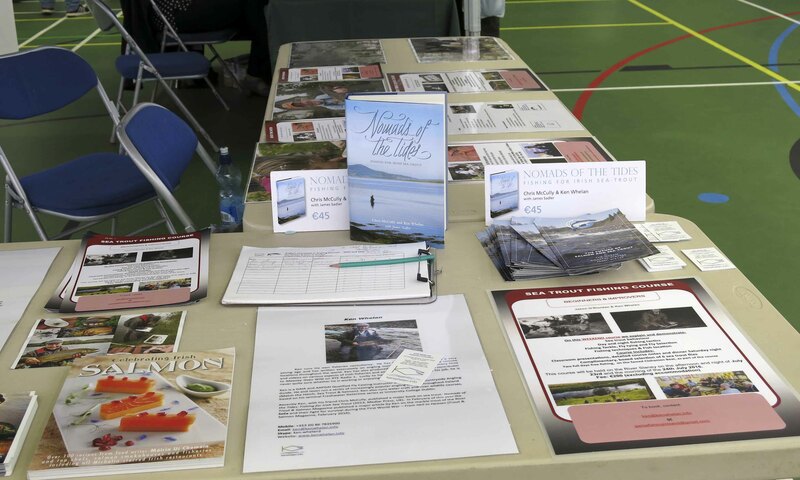 I also saw some very informative stands manned by the Loughs Agency people.Outside there was lots of free tuition for beginners and especially youngsters. 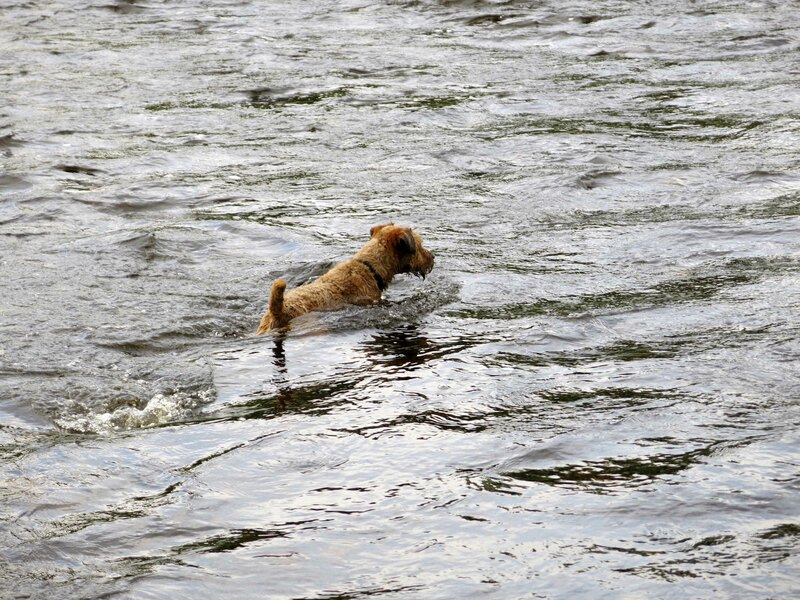 The river was only a stones throw (and I mean this!!) from the venue and there were casters giving demonstrations down there including my good pals from Mackenzie, namely Scott Mackenzie and Andrew Toft. It was great to catch up with these guys at the fair. The atmosphere at the fair was great with lots going on including the talks in the lecture room. Ken and I gave talks on Saturday on Seatrout fishing which were really well attended and we had lots of interest at our stand area in our courses and people were getting Ken to sign his book Nomads of the Tides. 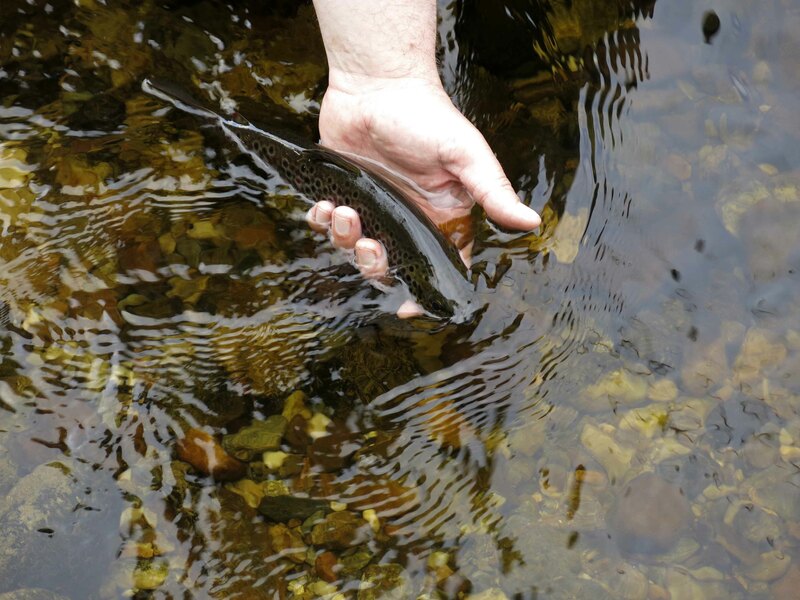 After the fair closed, I nipped down to the river with Brian and Ken and spotted some nice wild browns rising. I tackled up with a dry olive pattern of mine and waded out. 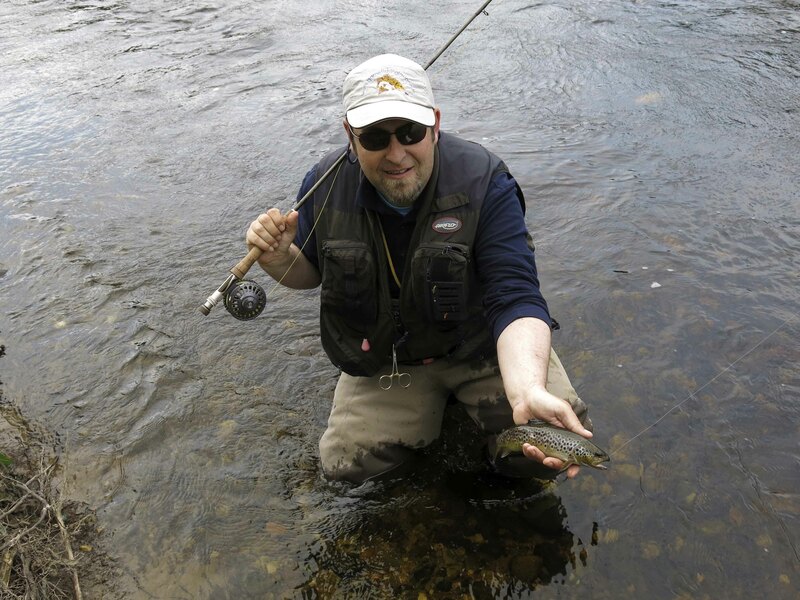 I managed to land 7 lovely trout in less than an hour and lost a few more including two about 1.5lbs. It was somewhat inevitable when I was trying to get them back across the current to the guys on the shore to get a photo. We did manage one nice video clip of a fish approximately .75lbs going back. On Saturday night we had an excellent dinner at the hotel and chatted with some of the other contributors to the show over a pint of beer. 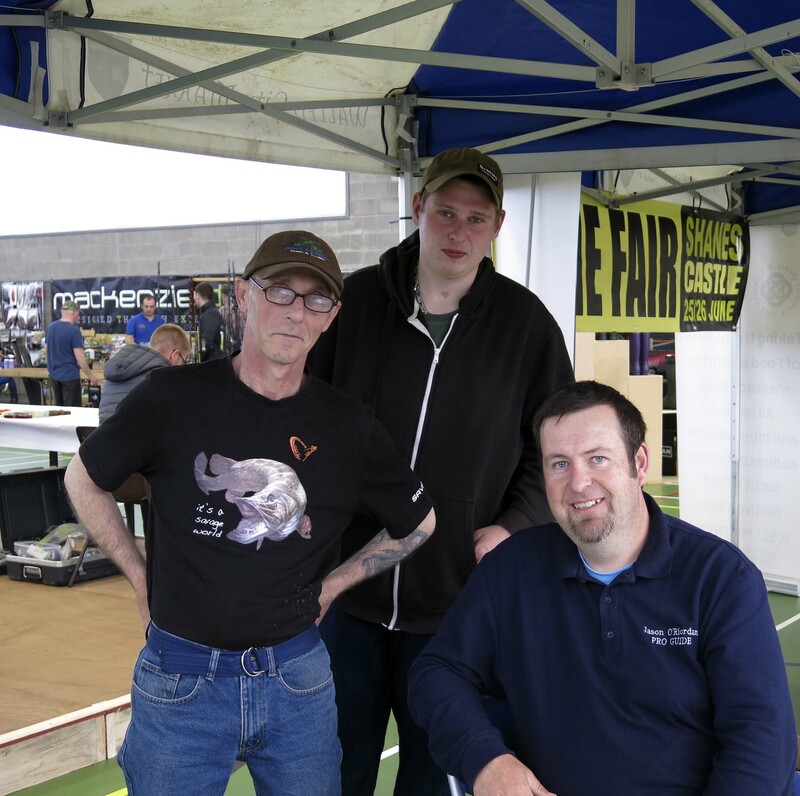 It was clear that they really enjoyed the fair and were keen to see it continue into the future. 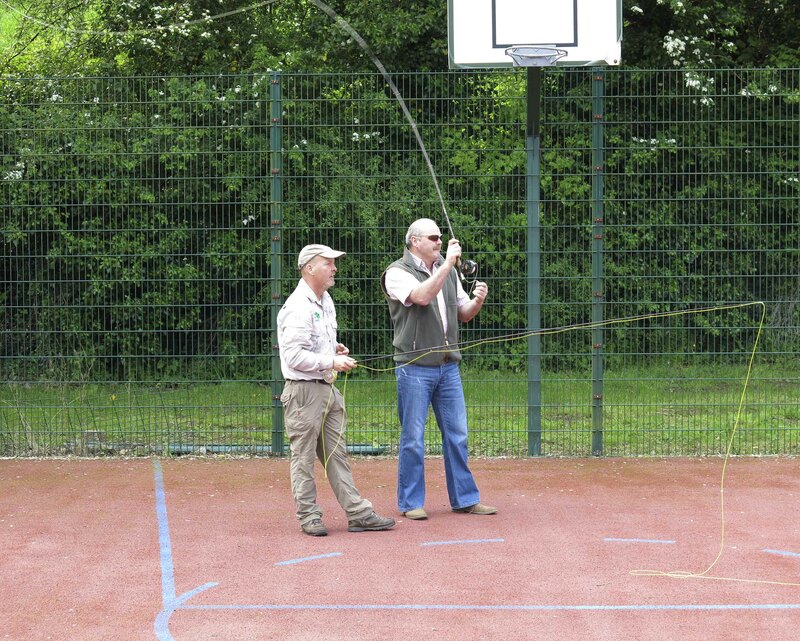 It was more of the same on Sunday and again our salmon talks went really well. 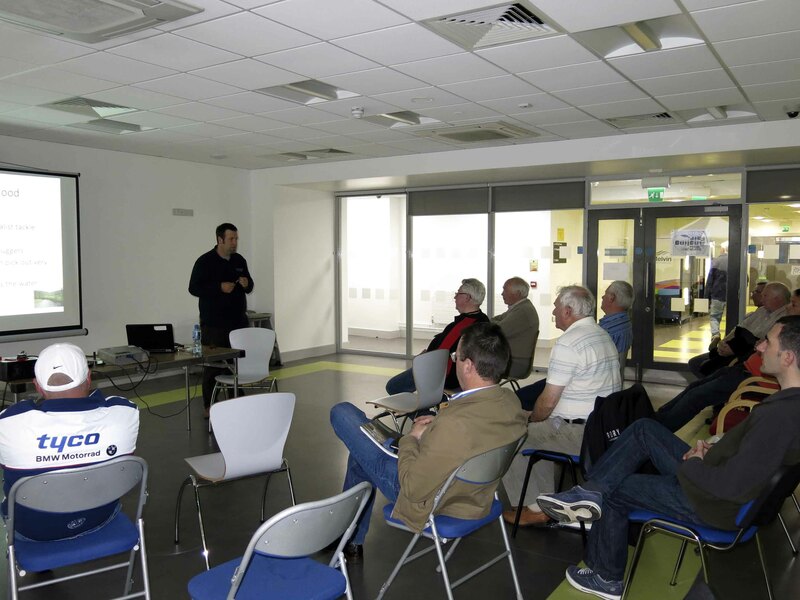 We were followed in lecture room by Stevie Munn who was talking about Dollaghan fishing. I didn’t mind the journey back on Sunday evening because the buzz of the fair was still there and the weather was great. This fair has great potential into the future and the organisers did a fantastic job for their first attempt. They deserve all the credit that goes their way. 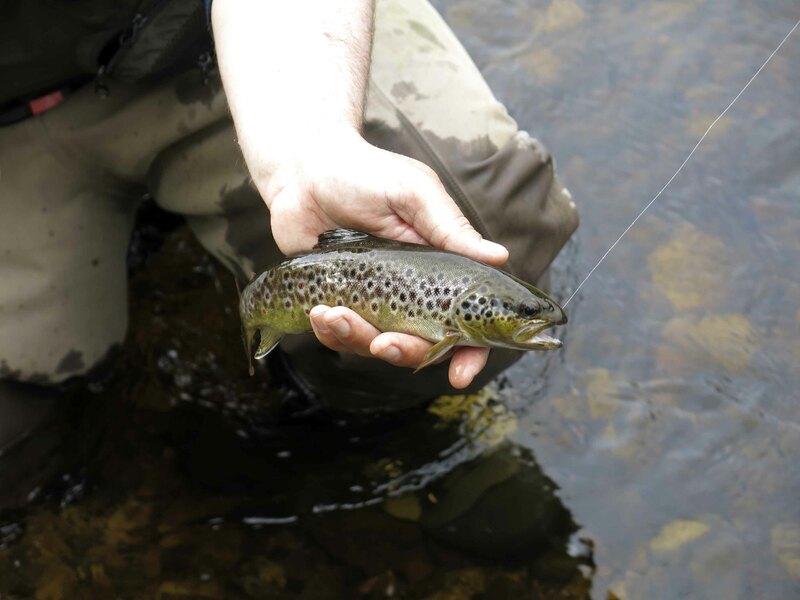 This entry was posted in Uncategorized and tagged brown trout, Fishing, fishing course, flies, fly fishing, fly fishing course, fly fishing ireland, guiding, Ireland, ireland fly fishing, irish flies, irish fly fishing, irish salmon flies, ken whelan, northwest angling fair, river mourne, scott mackenzie, strabane, wild brown trout by gamefishingireland. Bookmark the permalink.